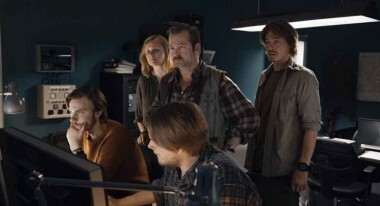 “Once these mountains grab a hold of you, they never let you go.” In Roar Uthaug’s The Wave, enervated chief Arvid Ovrebo (Fridtjov Saheim) waxes nostalgic to his handful of underlings, geologist watchdogs who command a state-of-the-art control center in western Norway that monitors the magnificent but unpredictable and ever-shifting mountains around them. It is situated high enough to withstand the brutal tsunamis that a sudden break-up can precipitate and that leave extensive damage to people and property in their wake — a phenomenon borne out by recent history. Nature is a tease: Most of the peaks abut serene, beautiful fjords — profitable lures for tourists who don’t have a clue about their part in these tragedies. The film is bracketed by scenes that illustrate the downside of the mountains’ tenuous relationship with people literally under their sway. It opens with still black-and-white archival footage of wreckage from landslides in 1934 and 1936 that were responsible for towering tsunamis that wiped out entire villages and killed dozens. 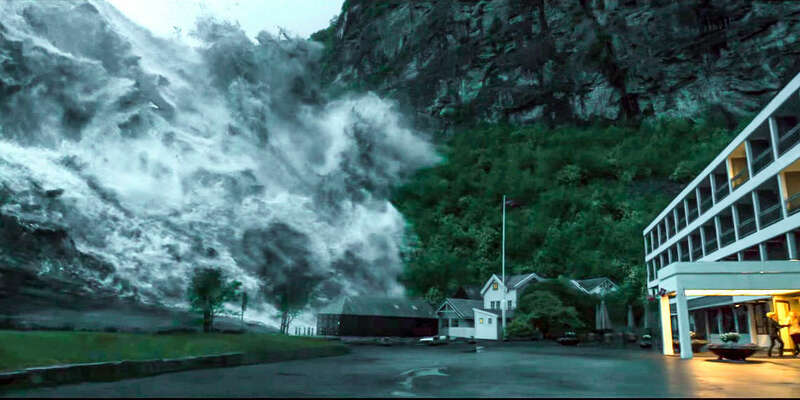 This being a full-fledged disaster movie, the final scene depicts the immobile remains of the damage wreaked by a contemporary counterpart, fictionalized but based on the very real, scientifically documented potential for a repeat performance when the precarious rocks of Akerneset contract, enabling the release of groundwater and precipitating with almost no warning an avalanche producing waves as high as 300 feet. In between is virtually non-stop motion, an effective foil for the general placidity of the setting. (Following the disaster, when small fires are about all that marks the landscape of the village of Geiranger, its apocalyptic emptiness serves a similar function for its vanished incarnation as a kitschy tourist magnet of gingerbread structures, which smug locals ride past on their bicycles.) Carving the strategy in stone, DP John Christian Rosenlund never stops moving his handheld cameras. In tandem with a beguiling widescreen format, the film has a vertiginous feel, and not just in scenes of destruction. The onslaught of motility begins with a rapid cut to the protagonist, the unassuming, casually hip government geologist Kristian Eikfjord (domestic star Kristoffer Joner), who is racing down a rural Norwegian version of a highway in a sporty car, restlessly shifting around in the driver’s seat and loudly singing along to a medley of recent rock hits. Uthaug is prepping his audience for unrelenting action on a far grander scale. The threat of our wild nature is something that is part of a lot of Norwegians’ daily life. But I am not sure how much we really are affected by it. It almost feels like it’s accepted as something that is just there, and that (there is) not much we can do about it. Maybe it’s odd, if an understandable, psychologically protective measure, that such potent settings can remain at all unconscious. Is it possible that this blase attitude — repression? — enables a gifted artist to elevate more easily the status of individuals against highly charged natural formations? After all, the filmmaker does paint his principal characters — Kristian and his family members — with a thicker brush than the ones typically used in the film’s studio predecessors. Ennui will most likely be collateral damage for the other family members, who are much less enthusiastic about the move. They include Kristian’s practical, stunning wife, Idun (box-office draw Ane Dahl Torp); difficult, hormonally confused teen-ager Sondre (Jonas Hoff Oftebro), a committed skateboarder whose self-centeredness results in a life-and-death plight for others; and a well-behaved little daughter, innocent, red-headed Julia (Edith Haagaenrud-Sande). To further humanize the family, Uthaug and his writers create internal conflicts. Father and son barely speak, their uncomfortable relationship in this fear-fraught genre requiring melodramatic rectification. Kristian, with Julia, and Sondre, in the company of Idun, remain on opposite sides of the fjord throughout the ordeal. In addition to the born leader he has proven himself to be, Kristian becomes an unusual but believable man of action once the tsunami hits. He is cheerleader for the panicked throngs attempting to reach higher ground during the 10 minutes they have between quivering onset and full activation. His quiet heroism extends beyond the disaster itself into the fallout. Running or paddling a tiny canoe, he serves as a one-man cleanup and compassion crew. Idun has her moments as well. Working in the Hotel Geiranger as a gorgeous prop of a receptionist, she suddenly morphs from calm Nordic beauty with an edgeless Nordic personality into fierce, physically adroit warrior, in order to subdue an increasingly deranged tourist, Phillip (Thomas Bo Larsen), who threatens her son. Rather than give away more, let’s just leave it at the recognition that one’s family in crisis is sufficient motivation for transcending conventional limitations, and that the climax in a simple cellar — which might hold the record for mouth-to-mouth CPR screen time — is brilliant as both solution and resolution. The basement is the lowest of the settings in a tragic narrative that starts amidst high peaks and drops rapidly downward, stopping just this side of a different hell.